InviroTech Spectra UltraViolet Germicidal Irradiation (UVGI) System, a product from InviroTech Systems, is your shield against micro-organisms in the air you breathe. Viruses, bacteria, molds, spores, fungus, etc. can grow rampantly inside the damp and dark HVAC systems and get distributed all over the buildings through the air conditioning systems, thus making your Indoor Environment infectious, unhealthy and unsafe to breathe. UVC rays are highly effective in killing germs without use of any harsh methods like chemical cleaning or steam injections. UVC rays are completely safe, environment-friendly and most efficient method for removing mold and bacteria from coils and drain pan surfaces. Also, by use of UVGI Systems you don’t need to worry about over dosing or storage, or get concerned with harmful by-products. Mold and bacteria built on cooling coils reduce the space between the fins and increases the pressure drop through the coil, resulting in higher operating cost of AHU Fans. About 37% additional energy is required to run AHU fans with dirty coils. UVC rays from Spectra eliminate the mold and bacteria on fins and provide greater savings on fan operation. UVC rays keeps coils clean, which also means lesser coil maintenance. 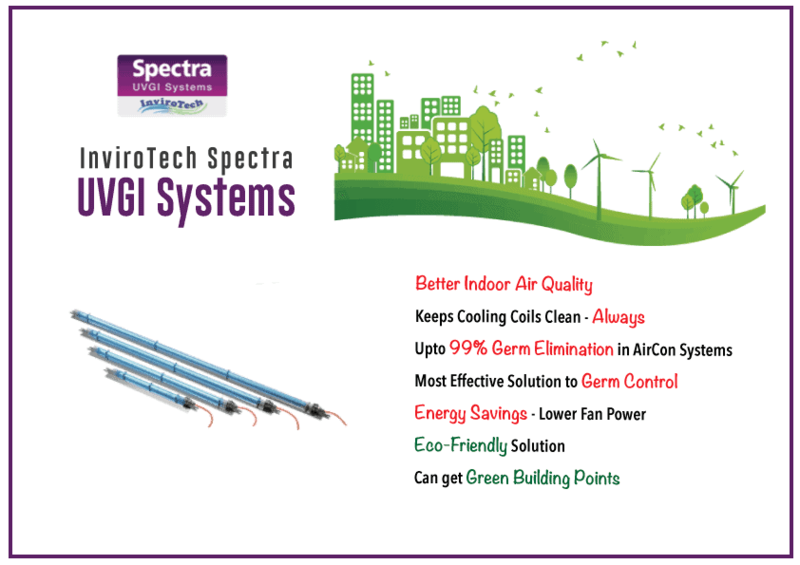 To know more about InviroTech Spectra UVGI Systems. Write to us!